In his exquisite novella The Old Man and the Sea, Ernest Hemingway writes of the ocean—“la mar“—with reverence, and describes the love that Santiago has for the beautiful sea. Indeed, as you stand on the shores of Venice, a city beloved by Hemingway, and a city floating on sparkling water, it is easy to understand Santiago’s deep connection with the sea. Venice has long been a city of mystery and there is a kind of magic in being surrounded by the water of the Venetian Lagoon. After walking in the hellish heat of Florence, the calming, balmy breeze of Venice was a welcome change. As we strolled past hundreds of artisan shops and stands, through the narrow calles of San Marco, and along the Grand Canal, we were awestruck by the charm and ingenuity of this ancient city. Although my homeland in southern California has the infamous Venice Beach and its boardwalk shops, nothing compares to the true Venice, with its gondolas and glass. On the wonderland that is this floating city, the cuisine of choice is naturally seafood, and Da Mamo, tucked away on Calle dei Stagneri near the Rialto Bridge, was a pearl set in a sea of gems. The interior of Da Mamo is dimly lit and small, should you wish to recreate one of the most famous pasta scenes in the history of American film. For a platonic group of friends, enjoy the retro American pop music (read: Whitney Houston’s greatest hits) and the extremely friendly waitstaff. The romantic, relaxing restaurant was just grand enough to be considered an experience, but still intimate enough for a cozy meal among good friends. At Da Mamo, every diner receives a tiny little appetizer, which on this particular night was some kind of delicate cheese thing with shrimp paste. Clearly, I wasn’t paying any attention after learning that it was made out of cheese. In addition, our server also graced us with packaged breadsticks, which were allergy-friendly and the perfect combination of bread and crackers, two foods I could eat endlessly. Our adorable waiter was attentive and brought us cold water with a little flirtatious charm. He was immediately understanding of the dairy and peanut allergies and zeroed in on exactly what I could eat: the spaghetti alla scogliera, a pasta dish with a delicious range of seafood in a gorgeous tomato sauce. Scogliera literally means “cliff” or “rock,” but in the case of pasta, means shellfish and crustaceans such as clams, mussels, and prawns. Other menu items, such as the famous Venetian ink pasta, were intriguing but alas, not allergy friendly. The dish came with a bowl for shells, and was a lot of fun to eat, between the extraction process and all the twirling of pasta. When I was younger, I was told that I was allergic to shellfish, and avoided it for years. Now, having grown up eating little seafood, it is not a food toward which I gravitate, but it is one that I occasionally enjoy. The delight was in the mussels and clams, not only because the bellies were meaty and perfectly juicy, but because the shells were like little soup bowls from which I was able to furtively slurp the sauce. The pasta was perfectly al dente and the only complaint I have was that there was not enough of it. 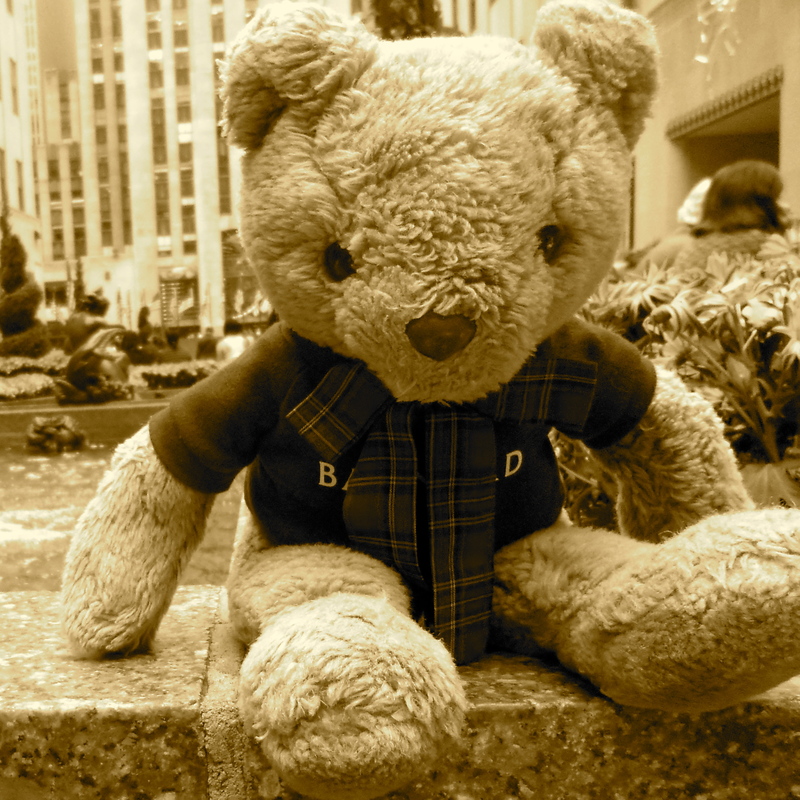 Photo courtesy of Matthew, who loves Bear so much that he followed us to Venice. Da Mamo also serves a tiny dessert for its guests, which in this instance was a miniature cup made of chocolate filled with a shot of limoncello. Although our server sadly informed me that the dessert was also not allergy-friendly, he did offer to eat mine. If you are disappointed that Bear and I were not able to have dessert, stay tuned because—spoiler alert!—we’re about to head there next. In The Old Man and the Sea, Santiago confronts one of the greatest monsters on the vast ocean: his own loneliness. Hemingway weaves a metaphor of man and marlin, exposing the dangers of going out too far alone, whether in a boat at sea or even farther across the great wide world. In the mysterious world of Venice, the most magical moments were not when the city flooded at high tide, nor when discovering “the most beautiful bookshop in the world,” but rather the ones spent in the company of loved ones, such as this delicious meal at Da Mamo.